When you apply for a credit card, loan or even certain services, such as cable and utility services, your lender will likely look into your financial background to determine how much risk is involved by approving your application. Lenders examine two primary types of debt that appear on your credit report: revolving debt and installment debt. Your ability to successfully manage both types of debt shows lenders and other service providers that you pose a low lending risk. Revolving debts are accounts that allow you to borrow money up to a predetermined limit. Using the account reduces the amount of credit available to you by the purchase amount. Likewise, repaying the borrowed money increases the amount available to you by the payment amount. Both credit cards and home equity lines of credit are examples of revolving debts. Unlike revolving debt, installment debt does not have a spending limit. You borrow a set amount of money up front and agree to repay it in equal payments -- installments -- over time. Mortgages and auto loans are examples of installment debts. Revolving and installment debts can be either secured or unsecured. When you apply for a secured debt, you must provide the lender with a form of collateral. If you fail to pay your debt, the lender may then seize the collateral you provided. For example, your mortgage is a secured debt, and the collateral on the loan is your home. If you stop paying, the lender will foreclose on your home. Unsecured debts, such as most credit cards, do not require collateral, and an unsecured lender cannot automatically seize your personal property if you stop making payments on your debt. 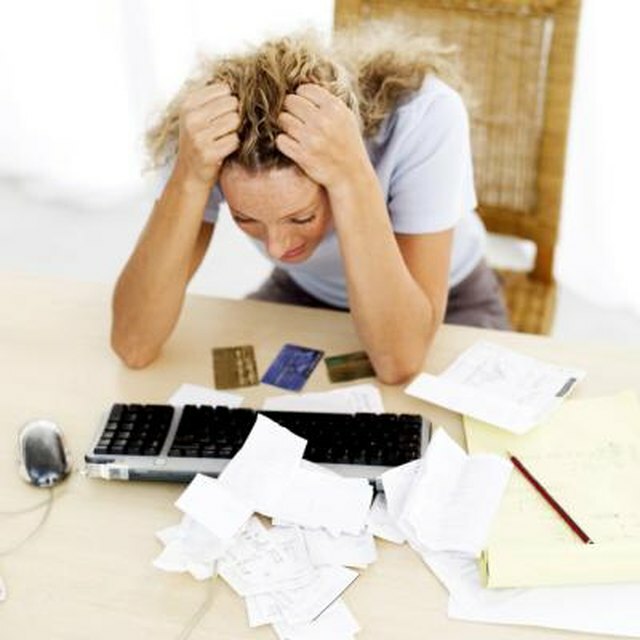 Many installment loans are secured debts. Because a secured lender can seize your collateral without a court order, installment loans are generally less risky for lenders than revolving accounts – which are often unsecured. Less risky loans carry lower interest rates for the consumer. Thus, you can expect to pay a lower interest rate on your mortgage than on your credit card accounts. Student loans are an exception to this general rule: they are unsecured installment loans, but many are guaranteed by the government to reduce the lender's risk and thus the interest rate they carry. Home equity loans are an example of secured revolving loans. Revolving creditors often have the right to increase your interest rate should you miss payments. Credit card companies, for example, will increase your interest rate if you make a payment more than 60 days late. Installment lenders typically won't increase your interest rate if your payment is late, but they may charge you additional fees. A multitude of factors come into play to determine your credit scores. The types of debt you carry is one such factor. The ratio of installment debts to revolving debts on your credit report accounts for 10 percent of your total FICO score – the credit score most lenders use. Because the scoring formula isn't public information, there is no way to determine the “perfect” ratio of revolving to installment debt. The impact this ratio has on your credit rating is minimal, but may increase if your credit record contains only a few entries. Realtor.com: What Happens If I Skip a Mortgage Payment?